Almost any plant will grow in a suitably sized container, so be creative and have fun! Don’t forget watering and maintenance considerations when reusing and building your own vertical container systems. Keep in mind that you are not limited to things intended for plants; virtually any receptacle that can hold artificial soil mix and adequately drain excess moisture will work. Wall hanging pots. Try hanging small terra-cotta clay pots, old coffee cans, or other containers to your wall using large pipe clamps or other creative techniques. Assemble dozens of small pots on a wall in a zigzag design or in a more structured approach, like columns. Again, be sure to drill holes in the bottoms of containers for adequate drainage. Pallet gardening. Pallets can also be used to grow vertically. You can take portions of the pallets apart, build some shelving, and customize your pallet container to accommodate your plantings. Rotating bicycle rim(s). If you really want to win the grand prize as the eccentric urban gardener, why not construct a series of unique planters using several aluminum bicycle rims? In place of a bicycle tube along the perimeter, wrap the surrounding rim structure with filter fabric and your growing medium. Secure the perimeter soil mixture and fabric with garden twine. While planting, lay the rim flat, and puncture holes around the perimeter of the wheel for seed starting. 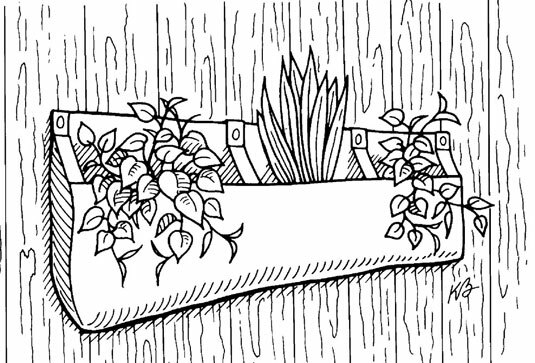 Keep the rim in a horizontal position until your plantings have sprouted and established a root network. Once your small greens have grown enough, you’re ready to hang up your rim vertically. Be sure to spin slowly while watering! Vertical containers. Many interesting containers that are made for hanging on a fence, wall, or post are on the market now. Imagine a wall filled with flowering containers of cascading plants, or a monoculture of salad greens! Pot hangers for containers. Instead of using pipe clamps, some garden centers now sell attractive pot hangers from which a terra-cotta pot can be hung on a post, wall, or fence. These hangers can be used to create a multitiered garden of radishes, chard, kohlrabi, lettuce, or other small greens. 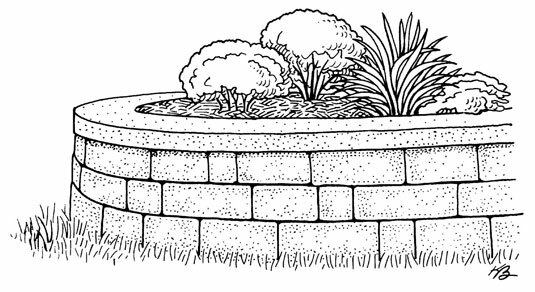 Other “half-round” containers are made for attaching to a wall or fence and make great use of limited space in city gardens. Planter walls. Manufacturers now include options for planting vertically along both freestanding and retaining walls. Another option to consider when building high retaining walls is to divide the wall height and include a terraced area for planting between the walls. Credit: Illustration by Kathryn Born. Straddling containers. Numerous products are available that can straddle both sides of your balcony railing, even along the top of a fence. The Steckling plants container is one example of a modern design that has a look of a simple circular planter, whereas more traditional balcony containers are more boxy like window planters. Wall hanging pocket gardens. Wall hanging pocket gardens are simple pocket planters which can easily hang and affix to walls, rails, and fences and can be used indoors or outside. They all come with simple fasteners and anchors that work on masonry, drywall, sheetrock, wood, and metal walls. The WoollyPocket garden is a great example and includes a “smart watering” system and reservoir, allowing water to slowly wick as needed to the plants root systems. In addition, the breathable felt liner allows excess moisture to evaporate. The pockets are made in the United States, using recycled plastic bottles. Stacking planters. Imagine picking the fruit from a stand of strawberries 3 feet high! Stacking planters are specifically designed so that when you stack them, they create a column of multiple and interconnected growing facets that may be suspended or just left freestanding. Nancy Jane’s Stacking Planters are one product specifically designed so that when you stack them, they create a column of multiple and interconnected growing facets that may be suspended or just left freestanding. Check them out at Garden Supply, Inc.
Vertical aeroponic garden systems. Numerous new aeroponic garden systems are available to help you grow vertically. A tower garden planting system is one example of a state-of-the-art vertical aeroponic growing system. It’s perfect for just about any relatively sunny place outside. Because of its unique technology and vertical design, the Tower Garden uses less than 10 percent of the water and land required by traditional, soil-based agriculture. Vertical Garden Solutions. If you’re looking for an assortment of different vertical gardening products, Vertical Garden Solutions offers many different vertical gardening systems. You can create a vertical green wall by using felt pouches, modular trays, or planting tubes. They have products available for small spaces, too, including self-watering vertical living walls made from modular tray systems.